Android users have not been the happiest of customers to date when it comes to the Facebook app for their preferred OS. Not any more. Facebook CEO Mark Zuckerberg recently downloaded the app for his personal use and all users around the world knew that if the CEO feels their pain, he’ll do something about it. Well, he did and he has. The new version of Facebook for Android has some new features like Events (inaccessible in the old version), friend requests, and video playback. There is also a new feature that the iPhone doesn’t have: a stream of thumbnail photos appearing at the bottom of the Facebook home screen, each of which represents a friend’s recent shared photo, video, or photo album. 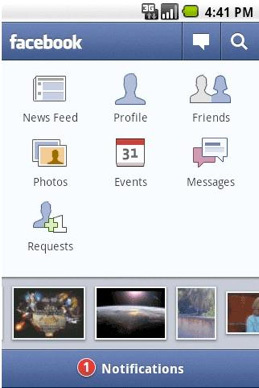 The new version supports all major Facebook functions and the images have improved too. It’s now become easier to open a link shared by your friends which was a hassle in the older version as you had to wait for a while for the small menu to pop up after you were directed to the wall of the friend who shared the link. Not any more, the annoying little menu is gone and the link opens with a simple click. Here’s a list of the upgraded features. •	The ability to post a status update or search for friends with just one click. •	A new photo reel that enables easy viewing of photos and videos from friends in your News Feed. •	A drag able Notifications drawer where you can easily see if a friend posted a note on your wall, commented or liked a post or tagged you in a photo. •	Video playback from the app. Similar to the Facebook for iPhone application, we are using the H.264 baseline profile for encoding videos. •	Support for Events. You can now review your upcoming events, read your event details, and even RSVP – all from the application. •	Respond to friend requests without leaving the application.